The following information summarises the work being carried out this coming week. It is correct as of the above date but could be subject to change due to weather conditions or unforeseen circumstances. Work to resurface the southbound exit slip road on the A1 at junction 17 near Peterborough will take place overnight on Tuesday 24 March for one night. The work will be carried out between 8pm and 6am. During the work the southbound exit slip road will be closed at junction 17. A diversion will be clearly signposted directing road users to travel southbound onto the A1(M) to junction 16 before returning northbound to junction 17. Non-motorway traffic will be diverted off the A1 southbound at its junction with A47 (Wansford) before being directed along the A47, Nene Parkway and A1189 to continue their journey. Work to replace sections of central reserve barrier on the A5 between Old Stratford and Little Brickhill near Milton Keynes will take place overnight for 17 weeks from Wednesday 25 March. The work will be carried out between 8pm and 5am and is scheduled to finish by the end of July. During the work there will be lane closures in both directions past the works. Work to improve the drainage system along the A12 northbound near Fryerning, Essex will take place overnight for three weeks from Monday 23 March. The work will be carried out between 8pm and 6am and is planned for completion by Friday 10 April. During the work there will be lane closures on the A12 northbound past the work. Work to improve the northbound entry slip road on the A1(M) at junction 6 Welwyn is taking place overnight from 2 March. These works are part of the Government’s £317m pinch point programme, which aims to boost local economies by reducing congestion and delays at key locations. The work is being carried out between 10pm and 5pm and is planned for completion by the end of May. During the works there will be a full closure of the A1(M) northbound between junctions 4 and 7. A diversion will be clearly signposted directing road users to travel via the A6129, B197, A1000 before re-joining the B197 and A602 to rejoin the A1(M) at junction 7. We are making improvements to the junction where the A1 meets the A47 at Wansford near Peterborough, Cambridgeshire, by installing traffic signals on the existing roundabout and widening local approach roads. These works are part of the Government’s £317m pinch point programme, which aims to boost local economies by reducing congestion and delays at key locations. We started the works on Thursday 15 January and have scheduled them to finish by the end of March. We are working between 8pm and 6am from Monday to Sunday. During the week starting Monday 23 March there will be lane closures controlled by temporary traffic signals. Further information is available on the project pages. A scheme to ease congestion and improve journey time and safety (part of the Government’s £317m pinchpoint programme, which aims to boost local economies by reducing congestion and delays at key locations) started in June 2014 and, subject to weather conditions, is scheduled to last for approximately eight months. It involves a new road alignment to enlarge and widen the existing roundabout, new safety fencing, improved drainage, new surfacing on the roundabout and installation of lighting columns and traffic lights. The work will normally take place between 7.30am and 5.30pm from Monday to Friday, with occasional night-time road and lane closures. There will be full southbound closures from Monday 23 March to Friday 27 March from 9pm to 6am. In addition, there will be northbound and A421 lane closures throughout the week, additionally there will be lane closures on all approaches on Saturday 28 March. During the closures, the A1 will be closed from Wyboston to Blunham, the diversion will be via the Wyboston/A428 interchange and Barford Road rejoining the A1 at Tempsford. During the road closures, traffic will only be able to travel along Barford Road southbound, and its weight restriction will be lifted temporarily. We are building a new, 2.9-mile two-lane dual carriageway, running from north of Dunstable and joining the M1 at a new junction 11a south of Chalton. The new road will reduce and improve the reliability of journey times for long distance traffic travelling around Dunstable, as well as cut congestion and promote economic growth. Advance works started on site in May 2014 and main construction work has now started. These works will require some road closures, which will be publicised in advance. The two public exhibitions days have now concluded and were well attended with over 600 members of the public. To view our display boards, which contain information about our construction as shown during these exhibitions, visit the Highways Agency’s website. Work on the major improvement is due to complete in Spring 2017. Further information is available on the project pages. Work to stabilise the embankment alongside the A14 at junction 38 and the A11 near Newmarket continues. The work is being carried out between 8pm and 6am and is planned for completion by 10 April. During the work there are lane closures past the works. We are installing average speed cameras on the A12 in both directions between J22 (Coleman’s Interchange) Witham and J24 Kelvedon North. These cameras will be used to enforce the 70mph speed limit and improve safety at this location. The works are part of a multi-million improvement programme designed to boost local economies, reduce congestion and improve safety on the strategic road network. The programme is part of the UK’s Government growth initiative, outlined during the chancellor’s Autumn Statement in November 2011. The programme provides smaller scale improvements that can deliver big returns by easing congestion and making journey times more reliable for road users, including hauliers and commuters to help boost local economies and drive economic growth. Works started on 17 February, which are being carried out overnight between 8:00 pm and 6:00 am on weeknights only, with occasional weekend working, and are scheduled to last for 6 weeks. Work will continue from Monday 23 March using overnight lane closures. Further information is available on the project pages. We are in the second phase of works to improve the road network on the A12 between junction 31 (Four Sisters Interchange) and junction 33 (Copdock Interchange). We are resurfacing the carriageway and renewing road markings, repairing barriers and drainage systems and improving lighting and embankments within these works. We are working each night between 9pm and 6am and weekends between 9pm and 8am the works are being carried out under contraflow running with a reduced speed limit. From Monday 23 March eastbound works will be carried out using lane closures with a reduced speed limit. The westbound carriageway will be closed overnight and a signed diversion route will be in place directing road users to travel along the A14, A137, A133 and A1232 to re-join the A12. The work should finish in May. We are in the second phase of works to improve the road network on the A12 in both directions between junction 11 (for M25) and junction 12 (for A1023 Chelmsford Road). We are resurfacing the carriageway and renewing road markings, repairing barriers and drainage systems and improving lighting and embankments within these works. During the week commencing 23 March works will be carried out under lane closures with a reduced speed limit. The work is planned for completion by the end of May. 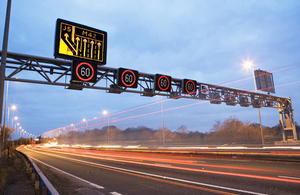 We are installing average speed cameras on the A12 in both directions at Hughes Corner, in Suffolk. These cameras will be used to enforce the 70mph speed limit and improve safety at this location. The works are part of a multi-million Pinchpoint improvement programme designed to boost local economies, reduce congestion and improve safety on the strategic road network. The programme is part of the UK’s Government growth initiative, outlined during the chancellor’s Autumn Statement in November 2011. The programme provides smaller scale improvements that can deliver big returns by easing congestion and making journey times more reliable for road users, including hauliers and commuters to help boost local economies and drive economic growth. We started works on 8 February and have scheduled them to last for seven weeks. The works will be carried out overnight between 8pm and 6am on weeknights with occasional weekend working. Work will continue from Monday 23 March using overnight lane closures. Further information is available on the project pages. Work to replace 14 signs along the A14 between Bury St Edmunds and Felixstowe will take place overnight for 15 nights from 9 March. The work will be carried out between 9pm and 6am on weeknights only and is planned for completion by 27 March. During the work there will be a lane closure in both directions on the A14 at various locations between junction 44 (Bury St Edmunds East) and A154 Felixstowe. Work to improve slip roads onto the M11 and A14 and to add an additional lane on the A14 in each direction between Girton and Histon is continuing. This work, which is part of the Government’s Pinchpoint Programme, is scheduled to take place mainly during the day, with existing lanes narrowed and a 50mph speed limit imposed. Between Monday 23 and Friday 27 March, there will be a full closure each evening of both the eastbound carriageway between junctions 31-32 and the westbound carriageway between junctions 36-32. Closures will be effective between 8pm and 6am. Local diversions will be clearly signposted. The planned completion date is spring 2015. Further information is available on the project pages. Improvement work started on Monday 9 February on the A14 in Ipswich between junction 49 (Stowupland) and junction 58 (Levington). The scheme which includes resurfacing, drainage renewal, replacing barriers, embankment work and removing defects in the road is due to be completed by the end of March. Monday 23 March – Wednesday 25 March inclusive: A14 westbound closed from 8pm to 6am between junction 58 (Seven Hills) and junction 55 (Copdock). A diversion will be clearly signposted directing road users to travel via A1156, A1189 and A1214 to re-join the A14 at junction 58. Thursday 26 March – Friday 27 March inclusive: A14 eastbound closed from 8pm to 6am between junction 51 (Beacon Hill) and junction 52 (Claydon). A diversion will be clearly signposted directing road users to travel via Norwich Road and Ipswich Road to re-join the A14 at junction 52. Work to replace sections of the central reservation barrier is being carried out on the A14 between the B660 and Spaldwick and between Brampton and Spittals near Huntingdon. Works started Monday 9 February and are due to finish by the end of April. We will be working between 8pm and 6am and will use lane 2 closures and a temporary speed limit of 40mph for safety reasons. We are making improvements to the A47 Walsoken / Broad End Road junction by installing new warning signs and renewing road markings at the location. Work should be finished by the end of March. We will work between 8pm and 6am and will use temporary traffic signals to manage traffic. Work to carry out bridge and safety barrier repair works is continuing on the A47 at junction 18 (Lincoln Road Interchange) in Peterborough. The work is being carried out between 8am and 6pm and is scheduled to finish in April. During the works there will be a lane closure in both directions between junctions 17 and 18 with a temporary 50mph speed limit. A diversion will be clearly signposted for abnormal loads directing westbound traffic off the A47 at junction 15 (Thomas Cook Interchange) along the A1260 Nene Parkway southbound to the junction with A1139 Fletton Parkway before taking the A1139 northbound to its junction with the A47 junction 20 (Dogsthorpe). Eastbound traffic will follow this diversion in reverse. Work has started on the first major improvement work on the Chelmer Viaduct in Chelmsford. The advance works, the establishment of the main access, a site compound and altering of existing street lighting on Chelmer Village Way, are finished. Main works have started and will take approximately 18 months to complete. Further information is available on the project pages. We are undertaking resurfacing works to the westbound carriageway of the A421 Bedford Southern Bypass. Works will involve renewal of the existing road surface. A 24-hour speed limit will be in place for safety reasons as working methods will require daytime traffic to run on temporary road surfaces throughout the duration of the scheme. Works started Monday 23 February and are scheduled to last for five weeks. Works will be undertaken between 8pm and 6am on weeknights. The road will be closed between its junction with the A4280 and its junction with the A6 at Elstow Traffic wishing to travel west will need to follow the clearly signed diversion route along the A4280, Newham Avenue, Longhome Way, A5140 returning to the A421 at the A6 junction at Elstow. Work is continuing to repair bridge joints and stabilise the embankment on the A421 at Cardington Cross south of Bedford. We are working between 8pm and 6am on weeknights only and the works should be completed by the end of March. To keep road users at a safe distance from the works we will need to close the A421 westbound between A4280 Goldington Road and A6 Elstow. Road users will leave A421 at the Renhold Junction onto the A4280 Goldington Road, turn left at the traffic lights onto Newnham Avenue. At the roundabout take the second exit onto Longholme Way, to the next roundabout with the A600 (London Road), take the A5140 (Rope Walk), continue along the A6 (Ampthill Road) to the A421. We are repairing the drainage on the A421 Castle Mill viaduct south of Bedford and the work should be completed by 13 May. This work will be carried out alongside the A421 Bedford Southern Bypass resurfacing works and we will need to close the A421 westbound between A4280 Goldington Road and A6 Elstow. Road users will leave A421 at the Renhold Junction onto the A4280 Goldington Road, turn left at the traffic lights onto Newnham Avenue. At the roundabout take the second exit onto Longholme Way, to the next roundabout with the A600 (London Road), take the A5140 (Rope Walk), continue along the A6 (Ampthill Road) to the A421. Members of the public should contact the Highways Agency Information Line on 0300 123 5000. Journalists should contact the Highways Agency press office on 0844 693 1448 and use the menu to speak to the most appropriate press officer.